Stately tree found in many established neighborhoods and cities in Missouri. Fast growing for an Oak, these trees are planted for their dense shade and formal habit. Usually excurrent in form, having a single trunk with lateral branches. Pin Oaks usually grow to a height of about 70′, the Missouri state champion, located in Stoddard County, is 99 feet tall with a crown spread of 92 feet. Click here if your tree is bigger to link to MDC. Dead wood naturally forms in mature trees as interior crown gets shaded. Iron chlorosis, or yellowing of leaves can lead to poor appearance and health if left untreated. Oak wilt is usually fatal to Pin Oaks and all trees of the Red Oak family. Acorns can be abundant and problematic, causing fall hazards in walking paths. Oak galls, rounded growths on branches and twigs, can be unsightly, but usually not harmful to the tree unless other stressors are also existent. Normally single stemmed, immature trees should have co-dominant stems removed. If co-dominant stems are allowed to mature, the tree should be professionally inspected for hazards, as tree support systems may be necessary to prevent breakage. Mature Pin Oaks should have dead wood removed regularly, usually every 3-5 years. Dead wood is unsightly, hazardous, and harbors overwintering insects and should not be ignored. A well-trained eye and skilled hand can prolong this cycle by thoroughly cleaning the crown of dead and dying branches. Chlorotic (yellow- leaves) trees and surrounding soil should be tested and amended as necessary to promote health. When properly maintained, Pin Oak can be a wonderful attraction to almost any landscape; un-kept, its greatest eyesore. Sweetgum is a medium to fast growing shade tree, relatively resistant to insects and disease, and tolerant of urban environments. In addition to shade, this tree is planted for a brilliant show of gold, red, and sometimes purple fall colors. This is usually a medium to large sized tree, growing to a height of 60-75 feet. The Missouri state champion is located in Scott County, at 82 feet tall with a crown spread of 67 feet. 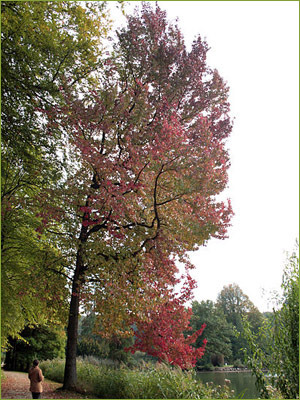 Click here if your Sweetgum gives this one a run for its money. GUM BALLS! Spiked, ball shaped fruit falling to the ground is a nightmare to clean up and a hazard to walk on. Naturally excurrent (single dominant stem), this tree sometimes develops co-dominant stems, creating included bark and a weak point in the crown. Unethical or uncaring tree services might recommend this species for regular topping, heading back, or ‘hat racking.’ This is the worst thing you can do for any tree, call a true professional or click here for more information on tree topping. Remove co-dominant leads at a young age, if mature trees have a co-dominant stem, the tree should be inspected, and a support system should be considered. Gum balls can be successfully controlled with a deflowering agent in early spring; the window of opportunity is narrow, so timing is critical. Sweetgums require some regular maintenance, but tolerance to difficult conditions and unbelievable fall color is worth it. Also known as Soft Maple, named for it’s weak, brittle branches, this fast- growing shade tree can be found almost everywhere in St. Louis and surrounding areas. Easily transplanted and often self-germinating from prolific seeds, these trees can reach a height of over 100′. The Missouri State Champion is 121 feet tall with a crown spread of 120′, located in Saline County. Click here if your Silver Maple is bigger. As is the case with most fast-growers, the wood is brittle and susceptible to breakage due to wind and ice. Wounded branches should be properly cared for, as decay will set in quickly on jagged, torn branches. Trees are often multi-trunked, sometimes creating included bark and the opportunity for decay. Prolific ‘Whirlybirds,’ or seeds termed samaras quickly germinate in gutters, sidewalk cracks, or any un-kept area. Insect infestations should be monitored regularly. Due to its natural size and weak wood, homeowners often seek to have these trees topped, or severely cut back, because they feel that the tree has grown too large. This practice only accelerates the decay of the tree, and creates a much more dangerous hazard in the long run. At a young age, branches with narrow angles should be removed. Dead or broken branches that can attract and harbor insects should be removed as soon as practicable. Branches encroaching buildings can be clearance pruned in accordance to ANSI guidelines. Mature branches with included bark should be inspected and supported as necessary. Silver Maples have a valid use in the landscape, if the surrounding area is large enough to support a tree of this size at maturity. These trees should be inspected periodically by a professional to mitigate risk and liability due to breakage. 4. Ash species, Fraxinus spp. Ash trees have been a long used city street tree, and also popularized in the suburban setting due to their filtered shade and wide sprawling crown. Most Ash trees display a bright yellow fall color, adding to their interest. There are several native Ash species in Missouri, most grow 50 to 80 feet tall with a similar spread in the urban environment. In forested areas, the trees tend to be taller and more slender. Missouri’s tallest living tree on record is a Pumpkin Ash. At 150 feet tall, this giant peers over Mississippi County, MO, and is also the National Champion Pumpkin Ash. Click here if you would like to see all the sizes of State Champion Ash Trees. Ash trees, similar to Pin Oak, naturally die back in the inner crown as the area gets shaded. This dead wood should be removed periodically. High value trees can be treated to prevent borer and other insect infestations. This is an annual treatment and can be successful in preventing fatal damage by EAB. This treatment is not successful in reviving trees that have already been severely damaged by EAB or other borers. Inspect your trees for D shaped borer holes about 1/8 inch across, as well as ½ inch long emerald colored beetles. If you suspect your tree is infested with Emerald Ash Borer call your local urban forester with the Missouri Department of Conservation. Dead trees should be removed and destroyed immediately to prevent any hitchhiking insects. Although this tree has been useful for many decades, and has been a favorite amongst landscape architects, planting of Ash species is not recommended until viable control for EAB or resistant varieties are discovered. Tree lovers should begin to cope with the fact that their Ash tree may need to be replaced in the near future. Bradford Pear trees have been planted, sometimes to excess, along city streets and private yards since the late 1960’s and 1970’s. At that time, the tree was only known for its unmatched flower show in mid-March, glorious leaf color in summer, turning to bright red in the fall, and its resistance to Fireblight. In the decades following, the tree has become famous only for its proficiency in breaking under the stresses of wind and ice, due to the branches stemming from the same area along the trunk and the included bark that forms. ‘Bradford’ should be properly inspected for hazard and supported with hardware to prevent or mitigate breakage hazard. We have had success with thinning the crown for air passage, and installing support hardware to keep these trees alive and healthy for many years beyond the average lifespan. We are so confident in our process, that we will guarantee that your tree won’t break, or we’ll remove it and replant another tree for free. Trees that have already experienced major crown breakage are potentially hazardous and will never regain their natural shape. These trees are candidates for removal. ‘Bradford’ Pears have been eliminated from many nurseries and replaced with improved varieties. If you are in love with yours, we can make it last many more years. Probably the most famous of all street trees, the American Elm lined many city roadways in the middle of the 20th century. It’s grand vase shape on both sides of the street created a canopy of shade for the underlying passage as the trees matured. 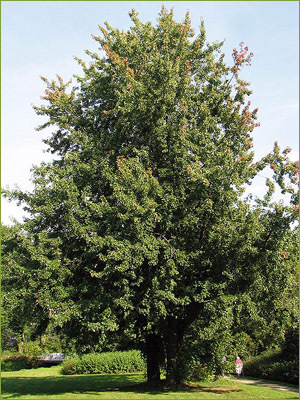 However, its overpopulation also led to its own demise as a sought-after staple in the landscape, as Dutch Elm Disease (DED) decimated the population over the past 30 years. Some estimates claim that DED is to blame for up to 500,000,000 American Elm deaths. The trees are vase shaped large shade trees at maturity, most growing to 60 or 80′ tall with a crown spread 2/3 of the height. The Missouri State Champion is located in St. Louis, at Bellfontaine Cemetary, and measures 102 feet tall with a spread of 122 feet. Click here if your American Elm is still alive and bigger than this. see above, DED is one of the biggest, causing sudden death in Elm trees. This fungal disease is vectored by bark beetles, as well as root grafts when an infected tree’s roots come into contact with a healthy tree’s roots. The presence of the fungus in the vascular system of the tree inhibits the flow of water and nutrients. Trees die off over the course of a season, and once dead, tend to fall apart quickly. (Usually within two years after death.) 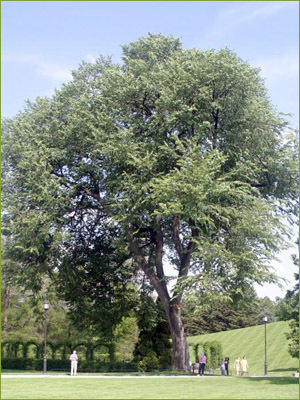 Many other diseases attack the American Elm, and it is impossible to diagnose DED without laboratory testing. Dead wood should be removed from the crown as soon as practicable, to prevent beetles from overwintering under the bark. Clearance and Vista pruning of major live branches should be done in the fall and winter months, when possible, to avoid attracting additional insects. Healthy trees of high value can be treated with fungicide only to stave off DED and other fungal diseases. Trees that are already infected cannot be saved, and should be removed and destroyed to prevent infection of nearby trees. Root zones between infected and uninfected trees should be separated with machinery to prevent disease spread through root grafts. The American Elm has secured its place in American history, but is not recommended for resale due to the reasons above. Plant breeders have been working with new varieties of Elms that are resistant to DED and other diseases with some success. Only time will tell if these new varieties are a viable replacement. 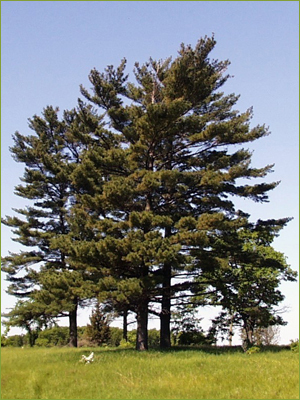 White Pine is one of the most widely used landscape evergreens in our area. The dense foliage provides a year round barrier from unwanted views and sounds, and also makes a nice windbreak. As with most evergreens, this tree prefers a well-drained soil and will not tolerate standing water or extended wet conditions. White Pine is one of the fastest growing landscape pines, growing to a mature height of 70 to 90 feet in 25 to 40 years. The National Champion is over 200 feet tall. Click here if your White Pine is over 100 feet tall. Brittle limbs are prone to wind, and especially ice and snow damage due to their dense evergreen needles. The trees are often misplanted in the landscape, in areas that cannot sustain a tree of this size. White Pines are often maintenance free if planted correctly in the appropriate area. Some owners like to remove the lower branches for the ease in mowing or walking under. Although I tend to gravitate toward the more natural form, this is a matter of personal preference. Branches must be pruned to a sufficient lateral, or the entire branch will die back to the trunk. Large evergreen works well for many uses. Hint: Try planting a group of White Pines as a backdrop with smaller flowering trees in the foreground. The contrast of light colored flowers against the deep green background is breathtaking. 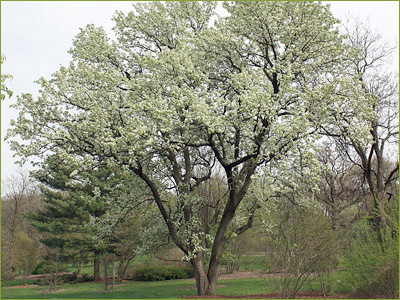 Flowering Dogwood is the official state tree of Missouri, and has been a long time favorite among native gardeners. 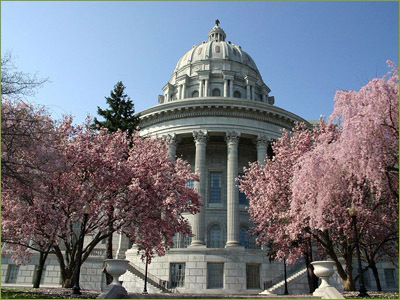 Missouri tree and flower lovers look forward to the mid-spring display every year. In addition to the two inch white flower bracts, the trees have persistent bright red fruit, and interesting bark as they mature. Small in stature, usually less than 25 feet, the Flowering Dogwood can be planted near power lines or other tight areas. The Missouri State Champion, in Mississippi County, is 34 feet tall and 41 feet wide. Click here if you think yours has a shot at the title. These natives tend to thrive in the forest under the canopy of the larger trees. I have the most luck planting in partial shade, but have seen them in full sun. Trees that are not stressed heat, drought, or other factors tend to do well. Borers, leaf spots, and other insects and fungi tend to attack stressed trees. Dogwoods are not very pollution tolerant and don’t grow well in poorly drained or extremely dry environments. As the trees mature, those with multiple trunks begin to split. These trees can be relatively maintenance free if planted in the right environment. Periodic watering during the hottest of summer months helps to reduce stress. Mature, multiple trunk specimens may require a support system to prolong their existence. Keep an eye out for chewing insects, while they usually won’t kill a healthy tree, they can ruin some of its seasonal landscape value quickly. Flowering Dogwood is a great native choice for a small tree with four season interest. I have planted several in my garden to compliment the multitude of wild specimens in the woods near my house. Despite some frost damage that has persisted from the nursery, the trees have done quite well with little help from me. 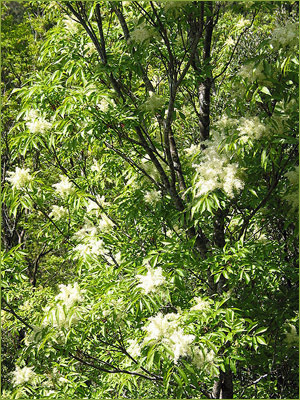 This is another small native tree that can add early spring color to your landscape. The Eastern Redbud flowers can be seen along nearly every country roadway in the state in late March through April. Earliest records show that this tree has been used as an ornamental since 1641. Growing only to about 25-30 feet, this is another tree that can be planted near utility wires. The State Champ, in Butler County, measures 34 feet tall and 36 feet wide. Click here if your Eastern redbud qualifies for the finals. Cankers can cause limbs and sometimes entire trees to die, fungal diseases such as Verticillium wilt can also be troublesome. Leaf eating caterpillars and other insects can cause damage. As with any plant, stressed trees are more susceptible to injury by insects and disease. Larger specimens can often benefit from a structural support system. In many cases, we have successfully supported an over-mature tree and planted its replacement in the same area. The support system can buy another 5-10 years, sometimes more, giving the replacement time to grow up and inherit that spot in the landscape. Cankers, when diagnosed early, can be treated with corrective pruning. Dead or dying branches should be pruned back to healthy wood immediately to prevent spread throughout the tree. Leaf chewing and boring insects can usually be easily eliminated using either a localized or systemic insecticide. Cracked or split trunks are a big problem with mature Eastern Redbuds. The tree can usually be preserved with a series of bolts, cables, braces and other hardware. Care must be taken, as large wounds tend to lead to other problems and decay in the tree. 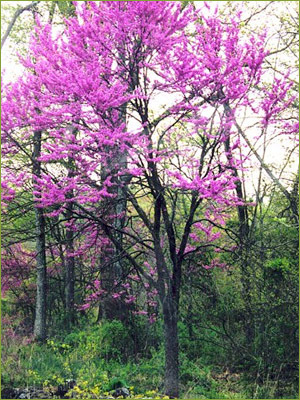 A staple in the Missouri landscape, Eastern Redbud is recognized by many as a beautiful native tree that provides us the first sign of true spring. White Oak, my favorite of all Missouri trees, is one of the most impressive shade trees to be found in our area. In addition to its landscape value, the White Oak has an impressive industrial history. Early trains used the wood to fire their boilers, settlers built homes and structures with it, and its wood is still used in whisky barrels. 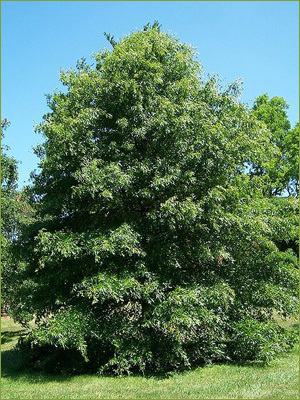 White Oak is a wide spreading shade tree that commonly grows to 80-100 feet tall in the forest, usually shorter and wider in the landscape. The Missouri Champion is 81 feet tall and Spreads 112 feet. Click here if your White Oak’s crown spreads farther than this. White Oak is very susceptible to construction damage. The trees do not tolerate severe root disturbance with machinery, soil compaction or grade changes. As the trees grow older, there tolerance decreases even more. I have witnessed many fine specimen’s demise due to careless or unknowing contractors digging up or changing the root zone. As a native, most of White Oaks normal pests do not cause a big problem, unless the tree is under stress from several factors at once. Trees of the White Oak family are susceptible to Oak Wilt, but the disease affects these trees differently than Red Oaks, and can be treated. 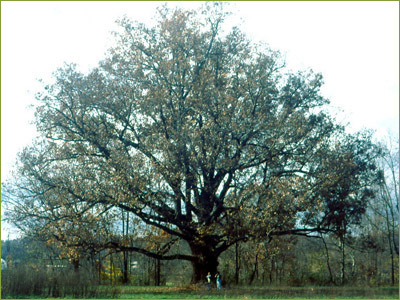 White Oak is a durable, long-lived tree that can survive centuries if undisturbed. Its sprawling shade, strong wood, and slow but steady demeanor make it my favorite tree.